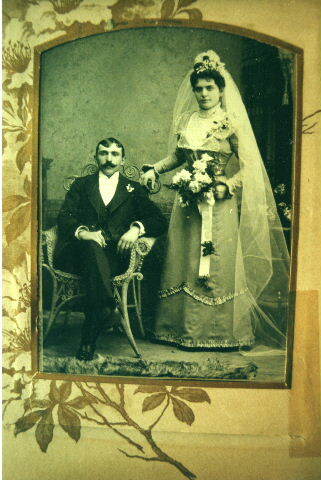 One of my most persistent mysteries was what happened to Veronique Mazeres after she married Baptiste Dupouy in San Francisco in 1899. My research turned up no leads in the census, city directories, or other sources. I was beginning to think that Veronique had gone back to France. After scanning many photographs from my Lassalle-Mazeres photo album, I looked over my research on the Mazeres (aka Mazeres dit Salanave). I was surprised to find that I didn’t even have a birth year for Veronique. And, this disturbed me greatly! I looked over what I had found in city directories. I found reference of a Baptiste Dupouy in the 1915 city directory for San Francisco. He owned a liquor business with someone with the last name of Loustanau. This surname is known to my French side of the tree, so this raised the odds that this was my Baptiste Dupouy. Let’s face it. How many Baptiste Dupouy’s could there be in San Francisco in 1915? I decided that it was worth giving Veronique another shot. I suspected that my inability to find out anything about her may lie in the tongue twister of a surname, Dupouy. I don’t even know how to pronounce it. I can only imagine how a census enumerator would interpret the French accent. I went back to the census. I found the Baptiste Dupouy mentioned above in the 1910 Census, but his wife was listed as Mary. Could Veronique have used Mary or Marie at times? I checked the 1920 and 1930 census with no luck. So, I went back to 1900. There was a possible entry under the surname Dupois. The wife was V.L., maybe V for Veronique? But, the husband was Bernard. They both were employed by a laundry. Amonst the French immigrants it was not uncommon for husband and wife to work in laundries–at least when it comes to my relatives. I tried to find more in online newspapers. I searched the California Digital Newspaper Collection. I had tremendous success learning more about the the divorce of Noemi Dupouy and nothing about Baptiste and Veronique! I did find an obituary for Baptiste’s cousin, John Henry Escouteloup, which gave me the names of Baptiste’s siblings. However, I found nothing on Veronique. I went over to the Ellis Island website to see if I might find something on Veronique Mazeres. I had searched before, but who knows, I might be lucky today. After all, I did find my Great Grandfather, Charles Mazeres dit Salanave indexed under Saliva. I had no luck there. I looked over an immigration record I had found on a Veronique Mazeres some years ago. This Veronique Mazeres arrived in New York in 1914. This didn’t really make sense unless Veronique and Baptiste were divorced. I didn’t think that was true. It was my understanding that she died around the turn of the century in San Francisco. But, I looked this record up online anyway. She was coming to see her husband, Michel Mazeres. Well, that settled that. I may have a little too much persistence for my own good. I don’t give up easily. Veronique was seriously getting on my nerves. How does a person disappear from the face of the earth without a trace? I decided to see if something new was posted at the San Francisco Genealogy website. They have been indexing mortuary records and early San Francisco vital records. Unfortunately, this was another big fat zero in the research column. I threw in a couple searches at findagrave.com. But, again, I got nothing. I was going to call it a night and put Veronique away for good. 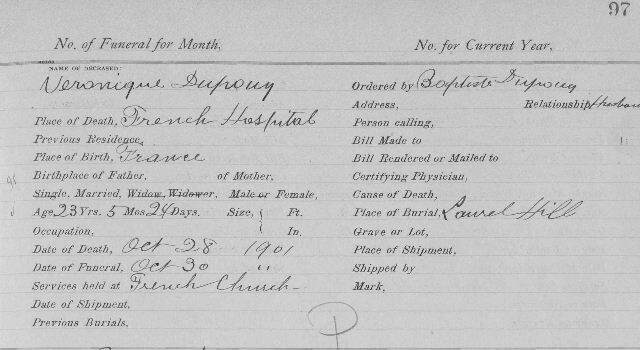 It occurred to me that I might not have searched for the Dupouy’s in the San Francisco Mortuary collection at familysearch.org. It was way passed my bedtime anyway. Fifteen more minutes wasn’t going to hurt. I put in the surname Dupouy to start. And…BINGO! I found Veronique’s mortuary record. Veronique died in 1901. She was 23 years old. It doesn’t say what she died of. I’d guess childbirth. Unfortunately, there won’t be a death certificate since those records were destroyed in the 1906 earthquake. Also, official reporting of death records didn’t occur in California until 1905. One final note to Veronique’s story. She was buried at Laurel Hill Cemetery, also known as Lone Tree. This was an old cemetery within the city of San Francisco. It was one of the cemeteries that was removed from the city so as to make more room for the living. The coffins were dug up and moved to another cemetery. I have several of these reburials at Holy Cross Cemetery in Colma for my Kelly kin. In the case of Laurel Hill, the coffins were made of wood that did not stand the test of time. As they were dug up, they crumbled. Bones and wood were mixed together and without modern DNA tests it was impossible to tell who was who. Many of those at Laurel Hill was buried in a mass grave. A cousin has informed me that Veronique was one of them. Though she no longer has her burial spot, with this mortuary record I can now lay her to rest. I now know the ending to Veronique (Mazeres) Dupouy’s story.